MPS at the wheel of the Corolla at BIR in 1991. Mark Strohm is DAMN-IT's unofficial "wrench" when it comes to big problems on the race cars. Mark has been an auto technician all of his working life, and runs a repair shop called SVS out of his home near Twig, Minnesota. He was formerly a co-owner of Foreign Affairs of Duluth, and before that ran a shop in Duluth called Swedish Express. 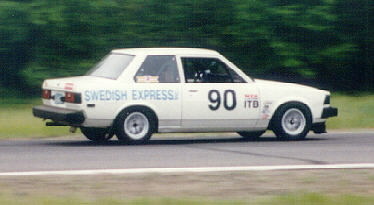 The Toyota Corolla that he races in ITB was a "rubber mat special" - a bottom of the line, no frills 2-door model. Spend time on construction projects at home, including a workshop for his personal cars. Mark opened the 1999 season by resurrecting the Corolla for the Jerry Knapp Memorial Races at Brainerd on Memorial Day Weekend, finishing 4th in ITB in the two races. During 2000, Mark did some tweaking on the Toyota, picking up a few seconds a lap. At the May Double Regional at CBIR, he took first in ITB and third overall in Saturday's Improved Touring race. Strohm qualified on the pole position in ITB for Sunday’s IT race, and came within a half second of the ITB record on the 3-mile course. He held the lead in ITB when his engine lost power on the third lap. The problem was later traced to a bent pushrod in the usually reliable Toyota engine. As long as the upper end of the engine had to come apart for repairs, Strohm made a few more allowable modifications to the head, with the aim of breaking the ITB record at CBIR. His next event there came in September at the Fall 2000 Challenge. He took the Toyota to the ITB class victory on Saturday, over 15 seconds ahead of the VW Golf of Steve Dahl. But it took until Sunday to accomplish the primary goal, setting the new class record at 2:04.904 on lap five of the 15 lap race. Unfortunately, a carburetor problem caused his Corolla to falter in the later stages of the race and he finished fourth in the category, handing the win to Dahl’s VW. Strohm ran only two races in 2002, a double race weekend at the new Mid-America Raceway in Iowa. Several years ago he began building a new car for the same class, a Volvo 142, but other projects have kept it from completion. The Toyota is for sale. Mark lives near Twig, Minnesota, with his wife Deb. RETURN to DAMN-IT Home Page.